The Best Fried Calamari is being deep fred at Kung Fu Thai and Chinese Restaurant in Las Vegas Nevada. 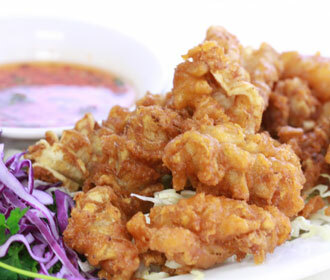 Our Cooks start off by using All white Squid sliced and textured, then lightly marinated to bring out the flavor which we then lightly batter then deep fried in pure Vegetable oil which contains zero trans-fat. It's then served alongside the House’s Special mildly spiced sweet sauce.